Many of you have drawn from their know how, trying to come to terms with how to best develop your organizations. 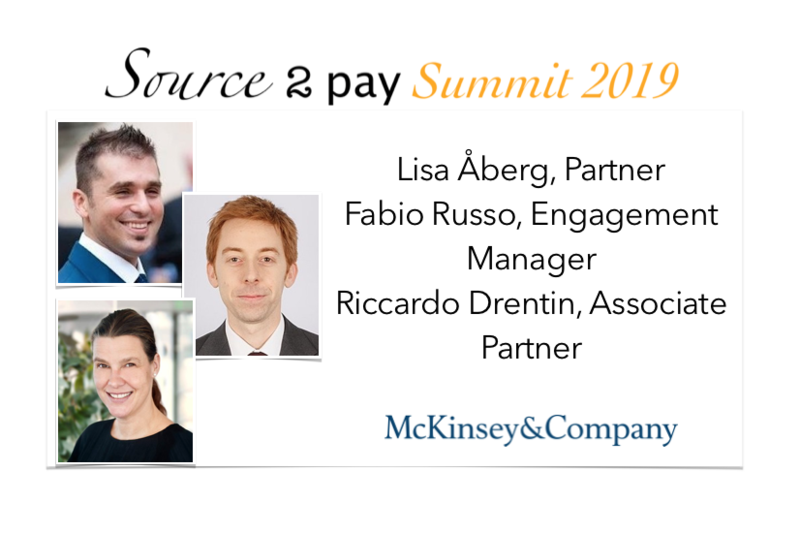 EBG | Network are glad to welcome a great team from McKinsey & Company joining Source 2 Pay Summit 2019. Lisa Åberg, Riccardo Drentin and Fabio Russo will join us sharing insights into how to transform using digitalization and what P&L effect source to pay efficiency may offer. Can we take more focus on digitizing processes? One may argue most data is already digital. The challenge in our view are using that data and improving efficiency in ways that give proven strategic effect – end to end. There is a lot more to be done to achieve that. Mind blowing! So why is it so hard? For one you should read the topics that will be discussed during Source 2 Pay Summit – all tailored by each moderator, ensuring we stay close to what are actual challenges and ways to overcome them. 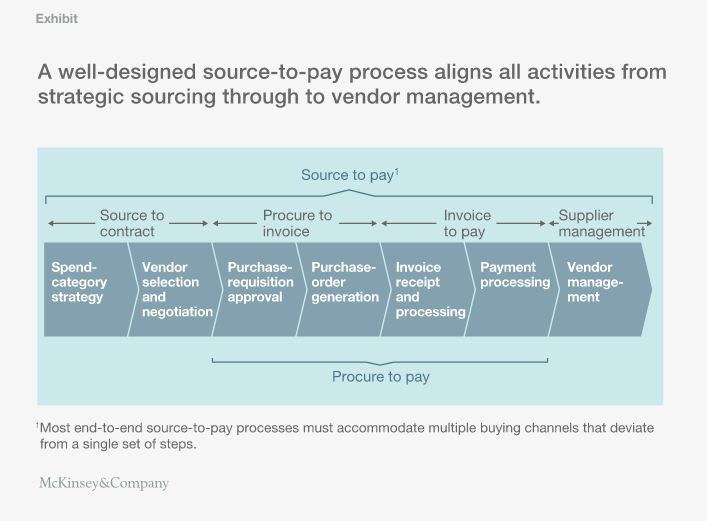 We define source-to-pay as the end-to-end value stream that encompasses all the activities required for an organization to obtain and pay for goods and services from other entities. These activities start with the development of specific sourcing strategies to best obtain the goods and services an organization needs. They continue with the selection of specific suppliers, contracting with those suppliers, the placement of orders, the verification that appropriate goods and services have been delivered, and finally the authorization and release of payment. In addition to these core tasks, the overall value stream also includes the activities necessary to support the end-to-end process, such as vendor and master-data management (exhibit). Why is digital transformation so hard? Even though the potential is evident, companies are struggling to see through the changes necessary to fully benefit from the benefits semi or fully automated processes may offer. What does that mean in reality? What difference would it make in the efforts to realize digitalization and automation strategies? On March 28th we will find out! Apart from a keynote Lisa, Fabio and Riccardo also invite you to dig deeper into and discuss Your challenges and opportunities – and to draw from your peers – during round table discussions. You are welcome to join us – registration is open and until December 31st there is an “Early Bird” offer available. You will not regret joining us.